What do you do when you can’t decide whether to launch yet another Avengers comic book series or yet another Conan the Barbarian comic book series? The answer is simple. Release a new Avengers series starring Conan the Barbarian, of course! It’s that kind of savant-like logic that earns Marvel the nickname The House of Ideas, and that’s why we’re getting Savage Avengers #1 “soon,” according to a glorified press release published as an EX-X-XCLUSIVE interview by Marvel media partner Entertainment Weekly, the ComicBook.com of general-purpose weekly Entertainment websites. Bleeding Cool reported that Conan would join the Avengers in March in Avengers No Road Home #6. This is an unsanctioned team of heroes. It has to be something that visually makes sense to you, and I think it does. 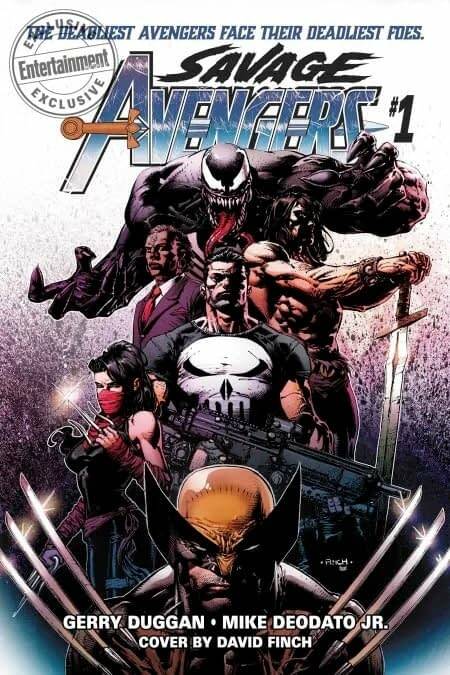 [Artist] Mike Deodato Jr. is illustrating this book in both worlds. We envisioned a threat, a magical green zone where the evil wizards of Conan’s world are trading spells with the Hand in Japan. Conan is on a very Conan-like mission; he’s heard a tale of an amulet so he’s chasing it, and the evil magic sorcerers are doing something that would be a Marvel Avengers problem. It feels like we have found some very fertile ground that is a Venn diagram between those two worlds. Is Detective Comics #1000 the Laziest Midnight Release Variant Cover DC Comics Has Ever Produced?